Macaroons are small, circular cakes made by folding whipped egg whites into a dough made from ground almonds and sugar. Typically they are flattened into a disc shape to ensure even cooking (like in my Orange Almond Macaroon recipe), but I like the gooey marzipan-like centre you get from rolling into spherical balls. Roughly chop the flaked almonds – no need to be perfectionist about it, as different sized pieces add to the texture. Place in a small bowl and set aside. Combine the ground almonds, honey, almond extract and salt in a mixing bowl. Mix to form a crumbly dough – if you are using set honey, or finding it difficult to incorporate the honey, then lightly rub it between your fingertips until the mixture resembles breadcrumbs. Wet your hands, then divide into 10 balls by loosely rolling between the palms of your hand. Insert a cherry into the centre of each ball, then roll between the palms of your hands again to smooth the sides. 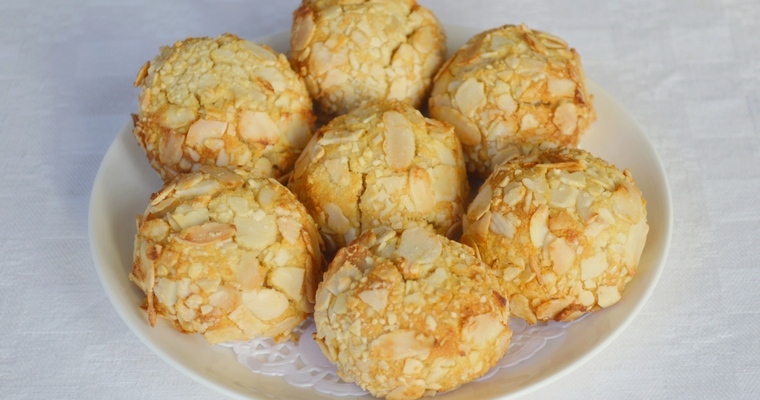 Take the bowl containing the flaked almonds and roll each ball around until evenly coated. Arrange on the lined baking tray. Leave some space between each macaroon, as they will spread slightly during baking. Use a pastry brush to lightly dab the surface of each macaroon with water.